To give via mail using a personal or congregation check, make the check payable to “The Lutheran Church—Missouri Synod” or “LCMS.” On the memo line, write “Earthquake Relief.” Or, write “Disaster Relief — Where Needed Most” on the memo line (which will allow the Synod to use funds wherever the opportunity or need is greatest, including but not limited to earthquake relief).Mail to: The Lutheran Church—Missouri Synod, P.O. Box 66861, St. Louis, MO 63166-6861. In the wake of two devastating earthquakes a little more than two weeks apart in Nepal, LCMS congregations and individual members are responding with gifts — and prayers — to help those who are suffering. A report from one member of an LCMS congregation mentions that loved ones in Nepal had lost everything and were huddled together under a tarp — praying for peace, comfort, sustenance and sanitary living conditions. The 7.8- and 7.3-magnitude earthquakes on April 25 and May 12, respectively, have affected 39 of 75 districts in the nation, killed nearly 8,000 people and injured at least 17,000 more. Following the April quake, tremors were felt across northern India and neighboring Bangladesh and Pakistan, with the most affected areas being Gorkha, Lamjung and Sindhupalchok, as well as the Kathmandu, Bhakktapur and Lalitpur districts. By the grace of God, the LCMS is reaching out in mercy and compassion to the victims of this disaster. Through its 70-year partnership with Lutheran World Relief (LWR), Baltimore — a relief and human-care agency that has boots on the ground in Nepal — the LCMS is disbursing $235,000 in grants to go directly for immediate provisions such as food, personal-care kits and water-filtration units. Of that commitment, $25,000 comes from the remaining disaster reserves that are funded entirely by donations, while the $210,000 supplement was made available from LCMS mercy/human-care reserves. As of May 11, the LCMS had reached nearly 12,000 individuals, providing 1,988 15-day ration food packs and distributing more than 2,000 temporary housing shelters through its LWR partnership. In light of the May 12 earthquake, the LCMS via LWR will incorporate further acts of mercy into its existing response to help bring relief to the many affected people of Nepal. 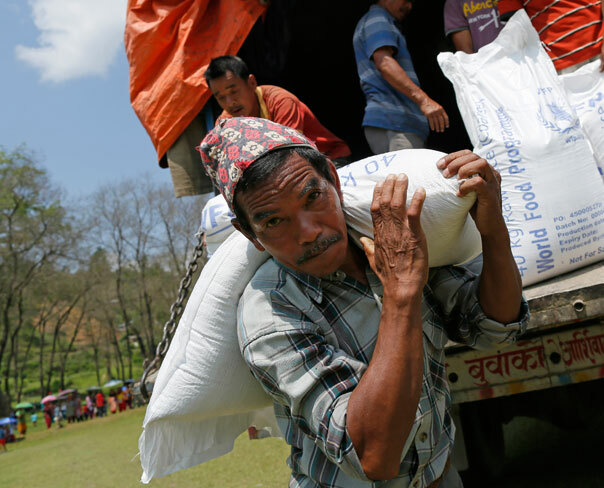 Since the LCMS does not have a partner church or missionary activity in Nepal, this strategic partnership and the LCMS Disaster Response grants provide an avenue for Synod congregations, members and friends to pull together as the body of Christ and directly care for their suffering neighbors. “When I choose to direct my help through Disaster Response, I join with other LCMS Christians to provide that which is needed to comfort and help,” explained Mark Hofman, executive director of LCMS Mission Advancement. “More important, though, I join my faith in Christ with theirs and speak that faith through my church body to make known Christ’s mercy and forgiveness as faithfully as circumstances allow. Hofman said that LCMS Disaster Response grants also provide a way for contributors to hear of the specific impact of the grant funds in the affected region and help ensure that the interests and integrity of LCMS members and congregations are uncompromised and used in ways that connect mercy with spiritual care, especially via Word and Sacrament. Fale and Hofman indicated that this “pooling together” of funds for the purpose of caring for people around the world who are suffering is a long-standing practice in the LCMS — so much so that the disaster-response fund often hangs in the balance between catastrophic events. Since the Synod is careful to provide not only immediate disaster response, but also ongoing care of people for years following a disaster, funds needed to provide these tangible expressions and acts of mercy and care need to be refilled on a near-constant basis. In the past few years alone, the LCMS has been responsive to a number of disasters in the U.S. and across the world map. “In the U.S.,” Fale said, “LCMS Disaster Response has been in Minot, N.D; Joplin, Mo. ; Moore, Okla.; West, Texas; New York; several communities in New Jersey, several communities in Colorado, and three communities in Illinois to assist the local pastors and congregations in reaching out to the community to provide gift cards that enabled people to purchase medicine, food, clean water, and safe housing. Victims of natural disasters who have seen significant support from LCMS Disaster Response include those affected by Superstorm Sandy, the 2004 South Asia tsunami, and Typhoon Haiyan. Fale said that the work of LCMS Disaster Response will continue throughout the course of restoration for those affected by the earthquakes in Nepal. “Our Lord has provided and will continue to provide for the needs of His people in the LCMS, so that they might serve their neighbors in Nepal and elsewhere,” he said. “The church never tires of showing mercy, and LCMS members likewise have shown tireless generosity and compassion to those in need. Through their support, people who have suffered the loss of loved ones, homes, provisions, and livelihoods have received the mercy of God through pastoral support, safe shelter, proper nutrition, clean water and work. In some areas where there was no Lutheran presence, the Gospel is now present through Lutheran pastoral care, mercy centers that care for body and soul, and efforts to establish permanent Lutheran congregations. “We live in a … broken world … , seen most obviously in an event like Nepal, or Pilger (Nebraska), or [Hurricane] Katrina where death and destruction seem to reign,” explained Hofman. “Sin is what creates a seemingly never-ending need for mercy care and human relief, and its pressure to secure funding to help make it possible. In the face of all fear and doubt, God reassures us that His promises will remain unbroken. “He gives us, through His bride the Church, His Word and the sacraments, the very forgiveness and strength He promises will be with us to the end of the age. It’s in the church that God supplies those who pray, give, offer words of encouragement and reassurance.